So you've decided to spindle spin. Now what? You need a spindle. Not just any spindle -- a spindle that you will love and that will inspire you to learn something new. There are a lot of different spindles to choose from. How do you pick? What do all of these words mean? Drop spindle? Hand spindle? Top whorl? Bottom whorl? What's a whorl? Takhli? What about all the different woods? What about the weight? At the very basic there are three types of spindle: top whorl, bottom whorl and supported. The whorl is the disk or ball that provides the weight to keep the spin going. 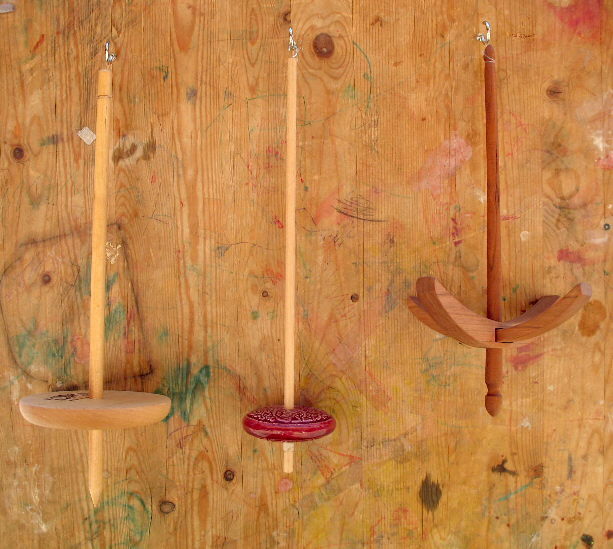 All three types are hand spindles. Top and bottom whorl are both types of drop or hand spindles. Drop spindles can spin almost any fiber you want from dog hair to flax to wool to Ingeo to silk. It has a hook on one end above the whorl and a shaft below the whorl for storing your finished yarn. Top whorl spindles can come in many weights and sizes. Top whorl spindles usually spin faster and quite often are lighter than their bottom whorl counterparts. They are great for very fine, lace weight yarns. They also usually are quicker to load since they have no need of wrapping or half-hitching to keep your yarn on the spindle. A bottom whorl spindle usually just has a shaft and a whorl, sometimes a hook and sometimes not. Finished yarn is stored above the whorl. To keep the yarn on the spindle, you usually have to do some wrapping and half-hitching. Bottom whorl spindles also come in various sizes. Bottom whorl spindles are usually less bouncy, spin longer and are better for plying yarns on than top whorl spindles. Of course, you can find rabid advocates of either top whorl or bottom whorl spindles. Just like you can rabid advocates of various types of spinning wheels, fibers, yarns or knitting needles. Your best bet is to take a few spindles for a test drive and decide what you like. Supported spindles are less common in both availability and usage. They can have hooks or not. They can have bead whorls or flat whorls. One end of a supported spindle sits in a bowl or some other shallow container and the working end hangs free. The spindle is spun and twist builds up in the yarn. The spindle is stopped and the twist is drafted out into the fiber. These types of spindles are best for spinning very short fibers like cotton or dryer lint or for spinning very fine. A Takhli is a type of supported spindle. Quick reference to spindle weights. Typically, the heavier the spindle, the fatter the yarn it will spin. So, you've decided what type of spindle you want and you're looking at spindle ads. They talk about featherweight, or .05 oz, or maxi, or boat anchor. What are they talking about? It's all about weight. The weight of your spindle to a great extent dictates how thick, or heavy your yarn can be. You can't spin lace weight yarn on a really heavy spindle and you can't spin bulky yarn on a featherweight. Starting out, unless you're really sure you are planning on always making lace or super bulky hats or only plying commercial yarns, you should choose a spindle that weights somewhere between 1.75 to 2.5 oz. This is a nice medium weight. Okay, you decided on the type. You've decided on the weight. What about woods? 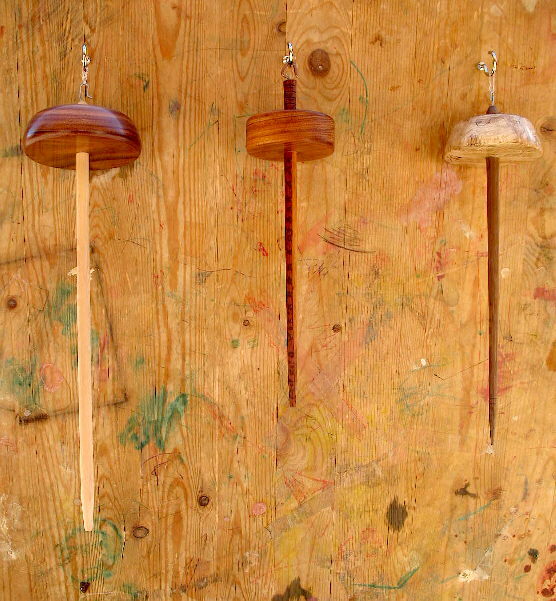 There are hundreds of woods that spindles are made of and a million combinations between whorl and shaft. (I won't even mention the ceramic or ploy clay varieties of spindles.) My advice is check the weight, check the price -- make sure both are in your range. Then let the spindle speak to you. Which one is gorgeous? Which one would you cry over if it goes home with someone else? Now where to buy a spindle? If you have the opportunity, go to a wool or fiber festival where you get your fingers on a several spindles and try them out. Or find a local spinning guild and do the same thing. A spinning guild has the advantage of usually having a "spindle person" who can give you pointers on how to use your spindle. You can also shop the web. You can find spindle reviews, spindler mail lists and spindle vendors. You can even find directions for making very inexpensive spindles out of old CDs and dowel rods (http://www.interweave.com/spin/resources.asp ). Or want to get better at spinning with a spindle? Practice as little as 15 minutes every day. You'll be a spinning maniac in a week. Four (of the many) spindle vendors on the web that are great at walking you through your first spindle purchase are Bosworth Spindles and Grafton Fibers if you want to buy from the spindle artist and The Bellwether and Carolina Homespun if you want a vendor that sells a variety of spindle artists. You've bought your spindle and starter fiber and they are staring you in the face. Where to learn how to spindle? A few great books are Spindle Spinning from Novice to Expert by Connie Delaney, Spin It by Lee Raven and High Whorling by Patricia Gibson-Roberts (out of print but available at many spinning retailers and libraries). This On the web try www.icanspin.com or the (Spin off magazine website ) Or find one of those "spindle people" at a spinning guild or spinning shop. Pick up a spindle. You'll be surprised how fun and relaxing it really is. You might even start looking at your knitting as sucking away your spindle time. 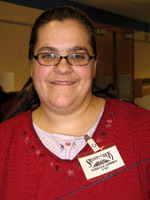 Rebecca supports her fiber habit as a children's librarian in Dearborn, MI. A long-time spindler, she finally broke down and bought a wheel about 4 years ago and finally learned to knit about 6 years ago. Her husband demanded she do something with the yarn she was making. Rebecca still packs a spindle almost everywhere she goes and can be found addicting, um, instructing spindlers with the Spinners' Flock in Chelsea, MI.